On May 7, 2005, we were blessed with the birth of an “Angel,” McKenzie Marie Schneider. She became known to the family as Mack, Mack and Cheese, Big Mack, Little Mack, Mackie and Sugar Sugar, because she was so sweet. She added joy to all of our lives by becoming the baby sister of our older twins Eddie and Bria. She was born with Down syndrome which presented many challenges... a heart defect, low muscle tone and delayed speech. But to us, our family, and friends she was so PERFECT. In February 2009, she was diagnosed with Leukemia and prior to the start of her chemo treatments, she was also diagnosed in the hospital with RSV, a serious respiratory virus which can take the life of any child. The medical staff moved forward with the chemo treatments and unfortunately it allowed the RSV to spread aggressively in her lungs. On February 28, 2009 McKenzie lost her battle to RSV and Leukemia and passed away. She touched so many lives in her 3-1/2 years which was very evident the evening of her visitation and funeral the following day. Approximately 1,000 friends and family gathered for her visitation the evening of March 4, 2009 and filled St. Joseph’s Church in York, PA the next day for her funeral. The outpouring of support was so overwhelming that we decided to keep Mackie’s life and spirit alive by holding an annual charity event entitled “Mack Madness.” The event is family oriented and includes children’s activities such as sand art, face painting, horse rides, games, and bounce houses! The day also includes an auction, raffles, live music, a chicken BBQ and so much more. All proceeds raised from the event are donated to charity. The National Leukemia and Lymphoma Society, York Area Down Syndrome Association and The Ronald McDonald House are a few of the charities we’ve donated to in the past. On May 30, 2010 we will hold our second annual “Mack Madness” event at Naylor’s Winery. Most of the proceeds from this year’s event will be donated to The National Leukemia and Lymphoma Society and the American Cancer Society. We will also support Mack’s “buddies” at the York Area Down Syndrome Association. It will be a day of mixed emotions but comforting to know that Mack is still making a difference from Heaven. Mack will forever touch the lives of those still here on earth. God, Mackie, family, friends and the many prayers we’ve received will continue to provide us strength. 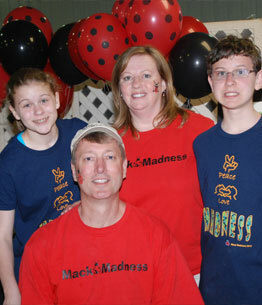 Mackie’s life and spirit will live on and we look forward to great success at Mack Madness 2010! Mack Madness is now on Facebook! Click the logo below and please "Like" our page!